It seems like a bunch of folks here are interested in home theaters, HDTV, etc. I just finished putting together the last bits of my home theater setup and I thought it'd be interesting to see how others are putting together their cool technology away from the computer. Post a picture or two and some details about your equipment if you like. Here's my setup. I just got the TV, so now the image matches the sound. Last edited by sunrain : 2006-01-16 at 01:01.
like i said in my other post, im looking into buying an hdtv. I mentioned it in another forum at another site and someone on there suggested this site: www.onecall.com. my question is, has anyone ever used this site or heard of it? ive never heard of it but i went there and it looks credable and the prices of the tvs are amazing. you can get a samsung 50-someodd inch 1080p tv for $3000. i mean the deals are crazy...almost too good to be true. lemme know if any of you have heard of this site and can offer any insite. Hee hee. Yeah, I noticed she was in the photo after the fact. I've heard of the site, but I've not bought anything from them. Make sure to post your setup after you make your buying decision. How much did those speakers run you? I need a couple towers for my setup. Unfortunately, they're no longer available. AR was bought out a couple years ago and their current speaker line doesn't resemble the quality they used to. I've noticed them on eBay from time to time. You might look there. We're building a home theater soon. We just bought a new house with a game room that will work well as a home theater. Speakers: I've only done internet research so far. Once I start listening I'll get a better idea, but I plan on looking at the Paradigm Monitor series, Energy Connoisseur, Axiom Audio, Ascend Acoustics and Bowers & Wilkens. We're going to paint the room a dark color, maybe taupe, and use blackout curtains on the windows. The screen will be on the long wall (18x15ft). The room is already wired for surround sound. It has a closet that's perfect for an equipment rack and snack bar. When you open the closet door, it has a a closet on either side. One will be an equipment rack, and we're going to put a mini-fridge and microwave on the other side. I'm thinking about building some acoustic panels, but I haven't even been in the room yet, so who knows what the acoustics are like. My mom worked at Acoustic Research and got a wicked discount on a pair of AR90's. This was a VERY long time ago and as a kid I loved to punch in the speaker cones. My parents agreed to never buy more speakers until we grew up and with good reason. I'll post a pic of our system in use when I can, though I'll probably need a fisheye lens to capture it all in one pic. Last edited by Ebby : 2006-01-16 at 21:45. Video Games: Xbox showing, Neo-Geo AES, GameCube, SNES, MSX2, Coleco, Dreamcast, Panasonic 3DO, N64, PS1, Gamegear, Atari Jaguar, Commodore 64, Commodore VIC20, Nintendo DS & SP, Sony PSP all hidden in the left and right cupboard plus the first drawer on thr right. Speakers: Jamo X870 for left and right. Paradigm CC370 for center. Two OEM Kenwood speakers for surround (they came with an older amp). No subwoofer (Jamo's have 10" woofers built in). Tivo: Series 1 Philips with 120GB drive. - Need to get a Definitive Technology SuperCube Subwoofer. Those two photos are really nice setups, sunrain and usurp. well I do live in Kuwait, the place where you can afford your dreams. Audio mixer to allow Airtunes (from powerbook) and movies (MacMini) to use same speakers with no switching. Number of electronic gadgets plugged in in the living room: Zero. Very cool everyone. Keep 'em coming. I watched a DVD on my lap last night... um... yea. It doesn't look it, but that image is 10 feet wide. ^^ that's basically what mine looks like except the ceiling's flat, all of the walls are drywall (or whatever they used 100 years ago instead) and there's a low bookcase under the screen, not a piano. I'll certainly not post a picture since my kids keep our TV room as messy as can be, but I will tell ya what I got. Back: Advent - Mini Advent bookshelf speakers. Also soon to be replaced. Its not much, but it does what I need for the moment. should i look into a power conditioner now that i just bought a big screen tv and im gonna set up my entertainment center???? I think they're totally worth it. If you're on a bit of a budget, you should check out TrippLite's line of products. edit: I do have an extra Panamax 1000+ power conditioner that I'd sell you for $75 if you're interested. I never use the DVD player anymore as I use the HTPC instead. It also streams music, plays video files, and allows me to watch full screened live MotoGP races. About the speakes, it's a HTiB that got good reviews. Since I'm currently stuck in an apartment and the speakers I want are just recently out of development I went the cheapest route. They work for the setting so I'm quite happy. The plan (once I move into my house) is to flush mount the speakers and TV into a false wall so that nothing sticks out. 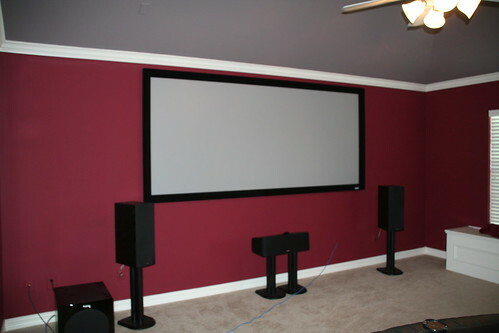 For movies I plan to get a projector and have the screen come down in front of the TV. But that's all into the future. YOu have my dream room! then its a half day of work and madden all night!! !